Shredding files with sensitive information is key to the safety and security of you and your family members, but at-home shredders can be messy and a pain. Instead of shredding your papers yourself, consider using a service. Residential shredding needs can be solved by various services. You can choose to have an industrial shredder brought right to your home, you can mail documents to a certified shredder, or you can drop them off at a nearby shredding location. Below you can find in-depth and supplementary articles on residential shredding services. Learn about industry terms, available services, and the best questions to ask your provider to ensure you get the best service. Check Out Any of the Articles Below to Learn More! Residential Shredding Services: How Will You Manage Your Home Shredding Projects? Shredding your personal paperwork is a necessity if you want to keep you and your family safe from identity theft. But the capacity of a personal shredder may not be enough. Aside from shredding your paper yourself, there are affordable services available to help keep residential customers safe. 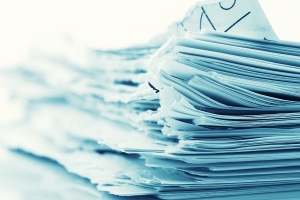 This white paper thoroughly goes over residential sized shredding service options, as well as industry terms you should be familiar with when researching your options and questions to ask your service provider. If you want to find out more about how you can complete a successful residential shredding project, read more in the articles below! Even at your own home, identity thieves can find ways to get their hands on your personal information. Shredding documents before throwing them away—such as those described in this video—will help to keep you protected. Shredding at home can be messy and inconvenient, but there are other ways to efficiently shred your private documents. Shredding services have expanded to include small scale projects, so residential customers have several options to choose from. Find out more about the types of services and the benefits of each here! Get Free, No-Obligation Quotes on Residential Shredding Services Today! Residential shredding will keep you safe if it’s done right. Call Shred Nations today at (800) 747-3365 or fill out the form on the right for free quotes on your shred project. We are happy to answer any questions you might and find the right service for you.